Home » In The News » Battery » Don’t change batteries every year! Get yourself a 10-year battery smoke alarm. It’s the start of Daylight Saving and every family member is encouraged to think about their fire safety, particularly smoke alarms. Whether you observe Daylight Saving or not, it’s a great time to think about your fire safety practices and the products in your home that keep you and your family safe. At this time of year you are encouraged to check your smoke alarms and change the batteries to ensure they are in working order. But why change your smoke alarm batteries every year if you don’t have to! Quell offers a range of 10-year sealed lithium battery alarms, meaning you don’t have to change the battery for the life of the alarm. 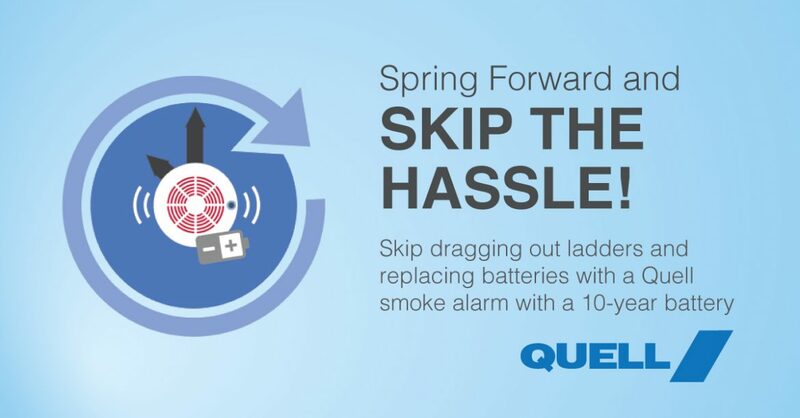 And to make everything so much easier, Quell has a smart way for you to clearly identify what smoke alarm is right for every room in the house. You simply go to our Easy Room Colour Selection Guide and select the correct product specific for your needs. Whether it’s for the bedroom, kitchen, living room or hallway, you’ll have the whole house covered. The simple colour coding system also categorises fire extinguishers, fire blankets and home fire safety kits for other areas of your home. Like the laundry, garage or workshop. With Quell, you’ll always find the right alarm for the right room, anywhere in your home. 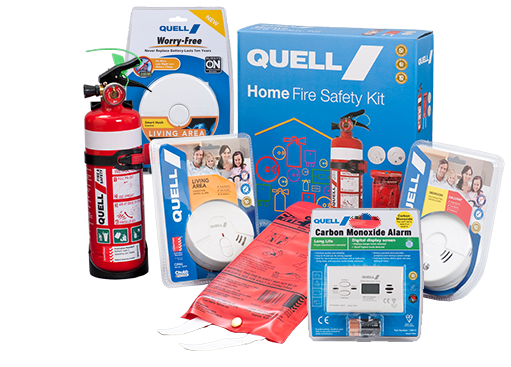 Quell have a complete range of smoke alarms that can quickly alert you to any fire danger. They’re designed with two main sensor types to detect fires in your home: ionisation and photoelectric. Quell also have specifically designed smoke alarms that detect the presence of carbon monoxide in the atmosphere. And with every Quell smoke alarm, they meet stringent guidelines. All Quell smoke alarms are certified to Australian Standard AS 3786. Take a look at our Worry-Free photoelectric smoke alarms. They can detect the fires that can smoulder for hours before bursting into flames. Say it was your bedroom. The photoelectric sensor is capable of detecting larger smoke particles produced by burning foam, rubber and synthetic materials. Trust Quell smoke alarms to safeguard your home. Know you’re safe, trust Quell.